For a number of very sensible reasons the history of Roman law has a prominent place within the study of legal history. However, in most cases we tend to focus on Roman private law, sometimes we take public law into account, and criminal law holds at its best a marginal place. This blog tries to avoid undue attention to Roman law, but there is no need here to exclude it completely. The current exhibition about Roman criminal law at Nijmegen (Nimwegen / Nimègue) at Museum Het Valkhof is an excellent occasion to look at this subject in some depth. Its title Plaats delict. Misdaad bij de Romeinen [The scene of the crime. Crime among the Romans] suggests correctly that artefacts will help you to get a better view of Roman attitudes towards crime. The exhibition at Nijmegen has been developed in cooperation with a number of German museums which created the travelling exhibition Gefährliches Pflaster. Kriminalität im römischen Reich [Dangerous pavement. Criminality in the Roman Empire]. At Museum Het Valkhof, a museum for art, history and archaeology, there is a clear stress on a way of presentation suited to young people. There is no accompanying catalogue, but only short texts with brief explanations about the objects put on display. Children are invited to play the role of Quintus, a Roman crime investigator, and to find out who has committed a murder. From Frankfurt am Main there is a skull with traces of a murderous attack. Children can also take a seat in a Roman court and deduce the exact way cases did take place. An inscription concerning a Roman investigator at Nyon (Switzerland) and an inscription telling us about the murder of a farmer certainly help to imagine how crimes touched the lives of very real people. 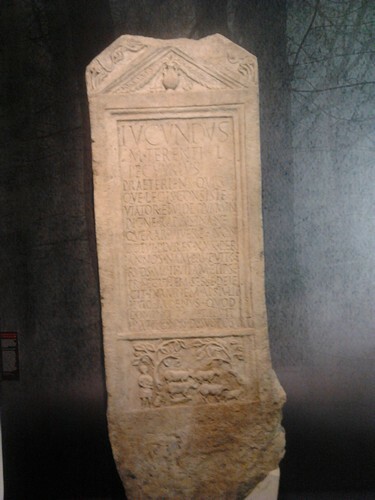 At Nyon Quintus Severius Marcianus had been very successful as a praefectus arcendis latrociniis, and his home town honoured him with an inscription. The crimes shown in this exhibition offer a wide variety, from theft and counterfeiting coins to playing with prepared dices, and from burglary to murder and the plundering of tombs. Punishments, too, show a great variety: penalties in money, hand cuffs, slavery and forced labour, and the death penalty in various forms, be it as a gladiator, fed to the lions, by beheading or crucifixion. From the perspective of legal historians it is remarkable that Roman law is scarcely invoked at this exhibition, often only implicitly or strictly in the context of an object. For lesser crimes your punishment would often be a fine, an amount of money to be paid. 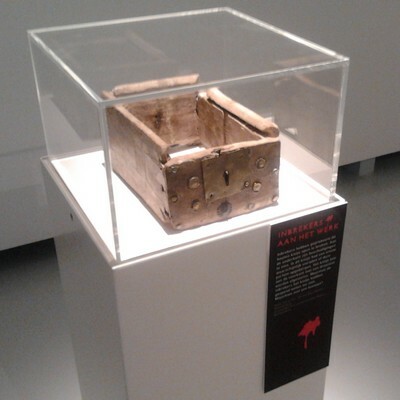 It is a pity the exhibition shows only a replica of a second century wax table with such a fine, held at the Archäologisches Museum Baden-Württemberg in Rastatt. 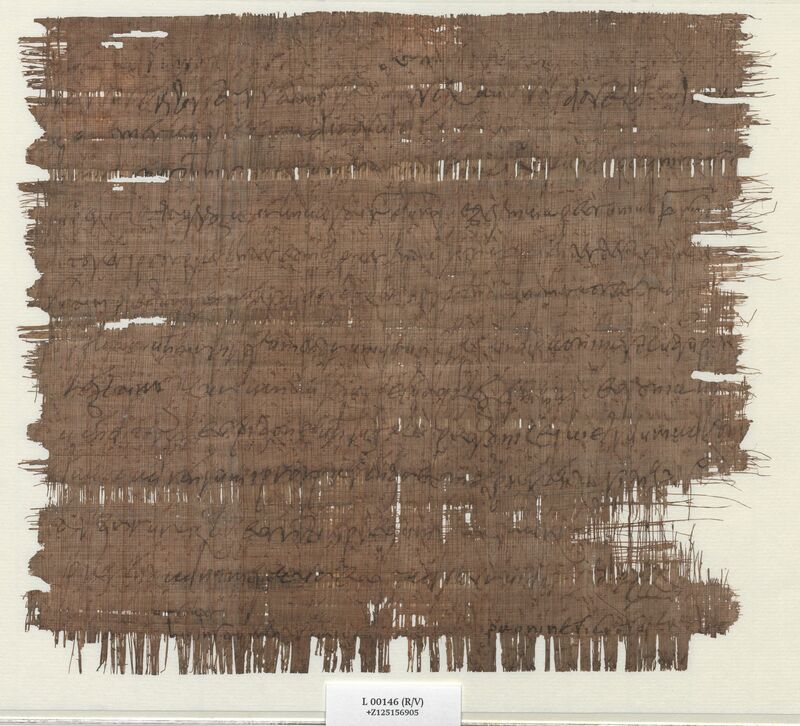 The longest text about Roman law in the exhibition gives a short overview of the various sources of Roman law. The major place of private law is mentioned, as is the efforts under emperor Hadrian (117-138) to unify Roman law. The Codex Justinianus is described as a text-book for students. Just two paragraphs to summarize a development of many centuries is simply too short to bring more than a few things to the attention of people. More to the point is the explanation about the accusatory nature of judicial proceedings. The parties involved had to bring a case themselves to court. The role of provincial governors to hear cases and to ask for judgments from the emperor himself is also mentioned, but none of this information is further corroborated. 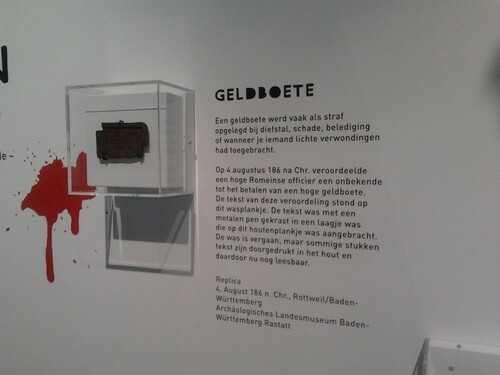 The information concerning the objects on display fares better, with nice captions such as Inbrekers aan het werk [Burglars at work] for a box with traces of an attempt to force its lock. Some walls of the exhibition rooms have been decorated with actual Roman wall paintings or evocative artists’ impressions, showing for example a number of inscriptions in a Roman settlement. The exhibition shows small statues of dogs given to the dead in their graves to protect the gifts accompanying their bodies. The ubiquitous Cave canem [Watch out for the dog] is only hinted at by showing a bronze head of a dog. I left the exhibition at Nijmegen with mixed feelings. It is easy to admire the telling array of objects, to learn about them from the concise information about them, and to get here a general impression of Roman life, crimes and punishments. The immediate involvement of children in an imaginary murder investigation is to be welcomed as an example of teaching a subject by making students play a role in a historical setting. However, I cannot ignore the lack of more information about the Roman judiciary, and in particular about its development. The quality of the information for each object is much better, but this shows also forcefully that texts – or maybe a video presentation – can enhance the understanding of objects. At the entrance of the exhibition you read the Romans faced much the same crimes as we do nowadays. The very substantial difference in punishments could have been highlighted stronger. The attention paid by Romans to safeguard their possessions could have been easily linked to their veritable obsession with hereditary law, the very heart of Roman private law. In the museum shop at Nijmegen with a nice selection of books on Roman history I searched in vain for the German book published for the original exhibition by Marcus Reuter and Romina Schiavone, Gefährliches Pflaster. Kriminalität im römischen Reich (Mainz 2013). Reuter works at the Archäologischer Park und RömerMuseum in Xanten, a town not far from Nijmegen, which makes this omission even more painful. Apart from the leaflet for children and a general flyer no printed information is available. In face of the Dutch fondness for English books studies such as Jill Harries, Law and crime in the Roman world (Cambridge 2007) and Olivia Robinson, The criminal law of ancient Rome (London 1995) could at the very least have been shown. For me it seems legal historians at the Radboud University Nijmegen have missed a chance to create for this occasion at least a succinct brochure which might redeem this conspicuous lack of further information. The city of Nijmegen can proudly trace its history back to Roman times, At Museum Het Valkhof is also a permanent exhibition about the Peace of Nijmegen (1678-1679), which without any doubt has benefited from advice by legal historians. Let’s hope they will exploit more actively future chances for cooperation with archives, museums and libraries, starting in their own town or region. While finishing this post I visited also the exhibition De Krim / The Crimea at the Allard Pierson Museum in Amsterdam, the archaeological museum of the University of Amsterdam. A splendidly flowing projection of tribes and their movements in the Roman empire from the first to the seventh century and a movie about excavations help here to see the context of the treasures shown. If I had noticed it earlier this year a posting about the Crimea and Ukraine would have been close to current world news, and for that reason the exhibition did not end in May, but will be open until August 31. In fact the museum fears either Russia or Ukraine will come with juridical claims when the objects would return now to the lending museums on the Krim (see a press release of the Allard Pierson Museum (August 20, 2014) and for example the Dutch newspaper Trouw, August 22, 2014). In one of the corridors of the Allard Pierson Museum is a small photo exhibition Culture under attack about the threats to cultural heritage worldwide since 1945. This entry was posted in Exhibitions and tagged Archaeology, Classical Antiquity, Criminal law, Epigraphy, Germany, Inscriptions, Legal history, Museums, Netherlands, Roman law on August 25, 2014 by rechtsgeschiedenis.